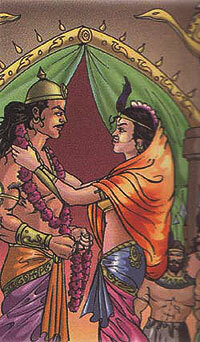 Betal narrated the story of King Satyapal to Vikram. When Satyapal ascended the throne of Chandadesh, the Bhil tribes were fighting for independence from Chandadesh. The country was poor and was under threat from Prachand Verma, a neighbouring King. Satyapal went to his ministers, who suggested that he should marry Prachand's daughter. Satyapal refused because Prachand's daughter considered him a weak king . One day, he met Kirtisena, the princes of the Bhils. Following her advice, Satyapal banished his corrupt ministers and became prosperous again. Then, he met the Bhil king and asked for Kritisena's hand in marriage. Having gained the faith of the Bhils, he now attacked Prachand and vanquished him. Betal asked Vikram "Was Satyapal's strategy right ? " Vikram replied "It was perfect because Satyapal put his house in order first before facing his enemies ."